Blödite Group: Mineral information, data and localities. A group of sodium metal sulphate tetrahydrate minerals. Synthetic members are also known for M = Fe. Stoilova D. and Wildner M. (2004): Blödite-type compounds Na2Me(SO4)2•4H2O (Me = Mg, Co, Ni, Zn): crystal structures and hydrogen bonding systems. J. Mol. Struct. 706, 57-63. [Blödite] Vennum, W. (1986) Unusual magnesium- and iron-bearing salts from West Antarctica. Antarctic Journal of the U.S., 21(5), 55-57. [Blödite] Benedetto, C., Forti, P., Galli, E., & Rossi, A. (1998). Chemical deposits in volcanic caves of Argentina. International Journal of Speleology, 27(1), 16. [Blödite] Crétaux, J. F., Létolle, R., & Calmant, S. (2009). Investigations on Aral Sea regressions from Mirabilite deposits and remote sensing. Aquatic geochemistry, 15(1-2), 277-291. [Manganoblödite] W.D.Birch (2013), A suite of hydrated manganese sulfates from the Womobi mine, northern Victoria, Australia. Australian Journal of Mineralogy, 17/1. ; A suite of hydrated manganese sulfates from the Womobi mine, northern Victoria, Australia. W.D.Birch, 2013, Australian Journal of Mineralogy, 17/1. [Nickelblödite] Nickel, E.H., Bridge, P.J. (1977) Nickelblödite, Na₂Ni(SO₄)₂.4H₂O, a new mineral from Western Australia, Mineralogical Magazine, March 1977, Vol.41 pp.37-41. [Blödite] Mills, S. J., Wilson, S. A., Dipple, G. M. & Raudsepp, M. (2010) The decomposition of konyaite: importance in CO₂ fixation in mine tailings. Mineralogical Magazine Vol.74(5) pp.903–917. [Blödite] Palache, C., Berman, H., & Frondel, C. (1951), The System of Mineralogy of James Dwight Dana and Edward Salisbury Dana, Yale University 1837-1892, Volume II: 449; Canadian Mineralogist (1985): 23: 669. [Blödite] Palache, C., Berman, H., & Frondel, C. (1951), The System of Mineralogy of James Dwight Dana and Edward Salisbury Dana, Yale University 1837-1892, Volume II: 449; R. Exel: Die Mineralien und Erzlagerstätten Österreichs (1993); Schorn, A., Neubauer, F., Bernroider, M. (2013): Polyhalite microfabrics in an Alpine evaporite mélange: Hallstatt, Eastern Alps. Journal of Structural Geology 46, 57-75. [Blödite] Kohut, C. K., & Dudas, M. J. (1993). Evaporite mineralogy and trace-element content of salt-affected soils in Alberta. Canadian journal of soil science, 73(4), 399-409. [Blödite] Renaut, R. W., Stead, D., & Owen, R. B. (1994). The saline lakes of the Fraser Plateau, British Columbia, Canada. Global Geological Record of Lake Basins, 1, 419-423. [Blödite] Zodrow, E.L. (1989) Summary report of secondary sulphate minerals, Sydney Coalfield, Nova Scotia, Canada. Nova Scotia Department of Mines & Energy, Report 89-3, Mines & Minerals Branch Report of Activities, Part A: 141-143. [Blödite] Last, W. M. (1990). Paleochemistry and paleohydrology of Ceylon Lake, a salt-dominated playa basin in the northern Great Plains, Canada. Journal of Paleolimnology, 4(3), 219-238. [Blödite] Shang, Y. (2000). Mineralogy, lithostratigraphy and geochemistry of North Ingebright Lake, Saskatchewan, Canada. PhD thesis University of Manitoba. [Blödite] Greengrass, K., Last, W. M., Deleqiat, J., & Suklmn, S. (1999). Waldsea lake Revisited: Another look at the Recent History of One of Western Canada's Best-studied Meromictic lakes. [Blödite] De Waele, J., Carbone, C., Sanna, L., Vattano, M., Galli, E., & Forti, P. (2017). Secondary minerals from halite caves in the Atacama Desert (Chile). In 17th International Congress of Speleology (No. I, pp. 242-246). Australian Speleological Federation Inc.
[Blödite] Am. Min.1989, V74, 1207-1214. [Blödite] Sun Da-peng, Li Bing-xiao, Ma Yua-hua, and Lin Qun-zhu (2002): Journal of Salt Lake Research 10(4), 1-12. [Blödite] Shaoxiu Yang (1991): Journal of Lake Sciences 3(1), 1-10; Zheng, M. P., Qi, W., & Yuan, H. R. (2005). Characteristics of salt lake boron deposits and magnesium borate deposits of the Qinghai-Tibet Plateau, China. In Mineral Deposit Research: Meeting the Global Challenge (pp. 1123-1125). Springer Berlin Heidelberg. [Blödite] Mianping Zheng (1997): An Introduction to Saline Lakes on the Qinghai-Tibet Plateau. Kluwer Academic Publishers (Dordrecht, NL), 319 pp. [Blödite] Zheng Mianping, Tang Jiayou, Liu Junying, and Zhang Fasheng (1993): Hydrobiologia 267(1-3), 23-36. [Blödite] Yanling Tang (2005): Non-metallic deposits of Xinjiang, China [Zhongguo Xinjiang Fei Jinshu Kuangchuang]. Geological Publishing House (Beijing), 289 pp. [Blödite] Matýsek D., Jirásek J., Osovský M., Skupien P.. Minerals formed by the weathering of sulfides in mines of the Czech part of the Upper Silesian Basin. Mineralogical Magazine, 2014, 78, 5, 1265-1286. [Blödite] Naze-Nancy Masalehdani, M., Mees, F., Dubois, M., Coquinot, Y., Potdevin, J.-L., Fialin, M. & Blanc-Valleron, M.-M. (2009): Condensate minerals from a burning coal-waste heap in Avion, Northern France. Can. Mineral. 47, 573-591. [Blödite] Steven M. Richardson (1978). Vein formation in the C1 carbonaceous chondrites. Meteoritics, 13, #1, 141-159. (March 1978). 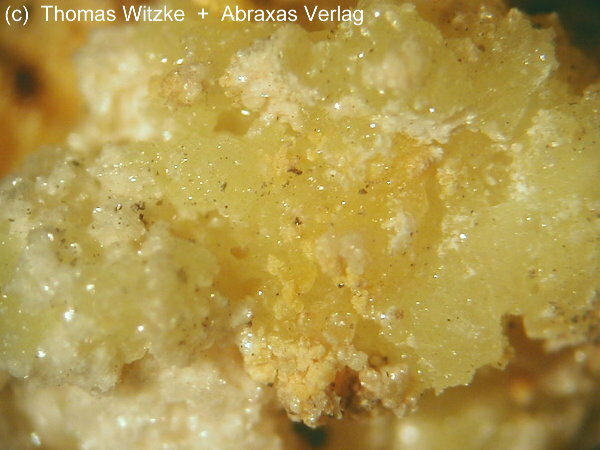 [Changoite] Rieck, B., Kolitsch, U., Voudouris, P., Giester, G. and Tzeferis, P. (2018): Weitere Neufunde aus Lavrion, Griechenland. Mineralien-Welt 29 (5), 32-77 (in German). [Blödite] Szakáll & Gatter: Hun. Min.Spec., 1993; Sánoor Szakáll, Mária Foldvári, Gábor Papp, Péter Kovács-pálffy, Árpád Kovács (1997) Secondary Sulphate Minerals From Hungary. Acta Mineralogica-petrographica, Szeged, Xxxviii, Supplementum, 7-63. [Blödite] Jacobsson et al (1992) Encrustations from Lava Caves in Surtsey, Iceland. A Preliminary Report: Surtsey Research Progress Report X: 73-78 Reykjevik, Iceland. [Blödite] Sinha, R., & Smykatz-Kloss, W. (2003). Thermal characterization of lacustrine dolomites from the Sambhar Lake playa, Thar desert, India. Journal of thermal analysis and calorimetry, 71(3), 739-750. [Blödite] - Russo, M., Campostrini, I., Demartin, F. (2017): I minerali di origine fumarolica dei Campi Flegrei: Solfatara di Pozzuoli (Napoli) e dintorni. Micro, 15, 122-192. [Blödite] Palache, C., Berman, H., & Frondel, C. (1951), The System of Mineralogy of James Dwight Dana and Edward Salisbury Dana, Yale University 1837-1892, Volume II: 364, 449. [Blödite] GARAVELLI A., GRASSO M.F., VURRO F. (1996): Mineral occurrence and depositional processes at Baia di Levante area (Vulcano Island, Italy). - Mineralogica et Petrographica Acta - 39, 251- 261. [Blödite] Pekov, I. V. & Abramov, D. V. (1993): Boron deposit of the Inder and its minerals. World of Stones, 1, 23-30. [Blödite] Bowell, R. J., Warren, A., & Redmond, I. (1996). Formation of cave salts and utilization by elephants in the Mount Elgon region, Kenya. Geological Society, London, Special Publications, 113(1), 63-79. [Blödite] Dana 6: 899; Palache, C., Berman, H., & Frondel, C. (1951), The System of Mineralogy of James Dwight Dana and Edward Salisbury Dana, Yale University 1837-1892, Volume II: 432 & 449. [Blödite] Dana 6: 947; Palache, C., Berman, H., & Frondel, C. (1951), The System of Mineralogy of James Dwight Dana and Edward Salisbury Dana, Yale University 1837-1892, Volume II: 449. [Blödite] Diaby, N., Dold, B., Buselli, E., & Vicetti, R. (2006). EFFECTS ON ELEMENT MOBILITY BY THE CONSTRUCTION OF A WETLAND ON THE MARINE SHORE PORPHYRY COPPER TAILINGS DEPOSIT, BAHÍA DE ITE, PERU. In 7th International Conference on Acid Rock Drainage (ICARD), March (pp. 26-30). [Blödite] Kruszewski, Ł. (2013). 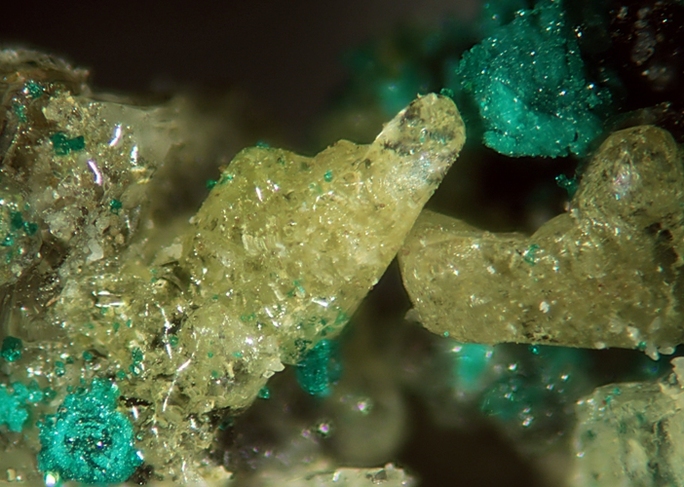 Supergene sulphate minerals from the burning coal mining dumps in the Upper Silesian Coal Basin, South Poland. International Journal of Coal Geology, 105, 91-109. [Blödite] Joana Ribeiro, Silvio R. Taffarel, Carlos H. Sampaio, Deolinda Flores, Luis F.O. Silva (2013): Mineral speciation and fate of some hazardous contaminants in coal waste pile from anthracite mining in Portugal. International Journal of Coal Geology, 109-110, 15-23. [Blödite] Cesnokov, B., Kotrly, M. and Nisanbajev, T. (1998): Brennende Abraumhalden und Aufschlüsse im Tscheljabinsker Kohlenbecken - eine reiche Mineralienküche. Mineralien-Welt, 9 (3), 54-63 (in German). [Blödite] Deyak M.A. Modern water-chemogenic formations of mud volcanoes of Kerch Peninsula. Dissertation to Scientific Candidate Degree in Geological Sciences in speciality 04.00.21 – lithology. –Department of marine geology and sedimentary ore formation of the National Academy of Sciences of Ukraine. – Kyiv, 2010. [Blödite] Mazurov, M.P., Grishina, S.N., Istomin, V.E., and Titov, A.T. (2007): Geology of Ore Deposits 49(4), 271-284.; Mazurov et al (2007) Geology of Ore Deposits, 49, 271–284. [Blödite] Okrugin, V. M. (2004). Miocene to Quaternary center volcanic, hydrothermal and ore-forming activity in the Southern Kamchatka. In Metallogeny of the Pacific Northwest (Russian Far East)-Tectonics, Magmatism and Metallogeny of Active Continental Margin, Interim IAGOD Conference, Excursion Guidebook, Dalnauka, Vladivostok, 2004 (pp. 147-176). [Blödite] Vizcayno, C., Garcia-Gonzalez, M. T., Gutierrez, M., & Rodriguez, R. (1995). Mineralogical, chemical and morphological features of salt accumulations in the Flumen-Monegros district, NE Spain. Geoderma, 68(3), 193-210. [Blödite] Mees, F., Castañeda, C., Herrero, J., & Van Ranst, E. (2011). Bloedite sedimentation in a seasonally dry saline lake (Salada Mediana, Spain). Sedimentary Geology, 238(1-2), 106-115. [Blödite] Calvo, Miguel. (2014). Minerales y Minas de España. Vol. VI. Sulfatos (Seleniatos, Teluratos), Cromatos, Molibdatos y Wolframatos. Escuela Técnica Superior de Ingenieros de Minas de Madrid. Fundación Gómez Pardo. 653 págs. [Blödite] Brian Mason (1962). Meteorites. John Wiley and Sons, Inc.: New York & London. 274 pages. [Blödite] van Doesburg, J.D.J., L. Vergouwen, and L. van der Plas (1982): Konyaite, Na2Mg(SO4)2•5H2O, a new mineral from the Great Konya Basin, Turkey. 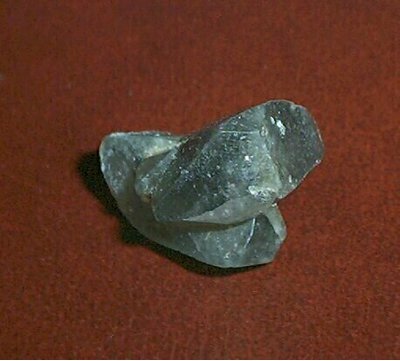 American Mineralogist 67, 1035-1038. [Blödite] Altay, T., Karakaya, M.Ç., and Murat, A. (2010): Goldschmidt Conference Abstracts 2010. [Blödite] Palache, C., Berman, H., & Frondel, C. (1951), The System of Mineralogy of James Dwight Dana and Edward Salisbury Dana, Yale University 1837-1892, Volume II: 449. [Blödite] Anthony, J.W., et al (1995), Mineralogy of Arizona, 3rd.ed. : 140. [Blödite] Murata, K.J. (1977) Occurrence of bloedite and related minerals in marine shale of Diablo and Tremblor Ranges, California. SGS Jour. Res. : 5: 638; Pemberton, H. Earl (1983), Minerals of California; Van Nostrand Reinholt Press: 267. [Blödite] Murata, K.J. (1977) Occurrence of bloedite and related minerals in marine shale of Diablo and Tremblor Ranges, California. USGS Jour. Res. : 5: 638; Pemberton, H. Earl (1983), Minerals of California; Van Nostrand Reinholt Press: 267. [Blödite] Sampson, Reid J. & W. Burling Tucker (1942), Mineral resources of Imperial County: California Mining Bureau. Report 38: 140; Ver Planck, Wm. E., Jr. (1954), Salines in southern California: California Division Mines Bulletin 170, ch. VIII: 5-14; Murdoch, Joseph & Robert W. Webb (1966), Minerals of California, Centennial Volume (1866-1966): California Division Mines & Geology Bulletin 189: 108; Pemberton, H. Earl (1983), Minerals of California; Van Nostrand Reinholt Press: 267. [Blödite] Adams, P., & Lynch, D. (2014). A mineralogical inventory of geothermal features southeast of the Salton Sea, Imperial County, California. Trough to trough: The Colorado River and the Salton Sea (Reynolds, R, 39-43. [Blödite] Jones, Blair Francis (1961), Zoning of saline minerals at Deep Spring Lake, California: USGS PP 424-B, Article 83: B200; Pemberton, H. Earl (1983), Minerals of California; Van Nostrand Reinholt Press: 267. [Blödite] Gale, Hoyt Stoddard (1914e), Sodium sulphate in the Carrizo Plain, San Luis Obispo County, California: USGS Bulletin 540: 428-433; Schaller, Waldemar Theodore (1916a), Mineralogic notes, USGS Bulletin 610: 148; Eady, A.F. (1966) Bloedite-Kristalle von Soda Lake, San Luis Obispo County, Kalifornien. Aufschluss: 17: 268-269; Pemberton, H. Earl (1983), Minerals of California; Van Nostrand Reinholt Press: 268. [Blödite] Murata, K.J. (1977) Occurrence of bloedite and related minerals in marine shale of Diablo and Tremblor Ranges, California. USGS Jour. Res. : 5: 638; Pemberton, H. Earl (1983), Minerals of California; Van Nostrand Reinholt Press: 267, 268. [Blödite] Minerals of Colorado (1997) Eckel, E. B. [Blödite] Zielinski, R. A., Otton, J. K., & Johnson, C. A. (2001). Sources of salinity near a coal mine spoil pile, north-central Colorado. Journal of environmental quality, 30(4), 1237-1248. [Blödite] Hon, K., Bove, D.J., Lee, L., and Thornber, C., 2009, The origin and zonation of sublimates and precipitates in active Hawaiian lava tubes: Geological Society of America Abstracts with Programs, v. 41, no. 7, p.193. [Blödite] Buck, B. J., Wolff, K., Merkler, D. J., & McMillan, N. J. (2006). Salt Mineralogy of Las Vegas Wash, Nevada. Soil Science Society of America Journal, 70(5), 1639-1651. [Blödite] Palache, C., Berman, H., & Frondel, C. (1951), The System of Mineralogy of James Dwight Dana and Edward Salisbury Dana, Yale University 1837-1892, Volume II: 449; USGS Prof Paper 68 The Ore Deposits of New Mexico.